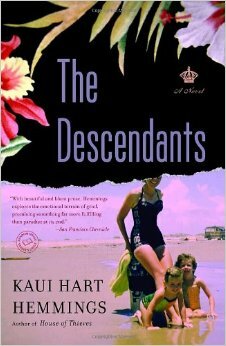 The Descendants is one of the earliest book to movie adaptations I blogged about back in 2011. I loved the book so much and I was thrilled it was coming to the screen, I had to share my passion and that was that. The beginning of Chapter1-Take1. That's the backdrop for today's Saturday Matinee, one of my all time favorite screen adaptations, available to stream on Amazon, YouTube and Vudu for about $3. 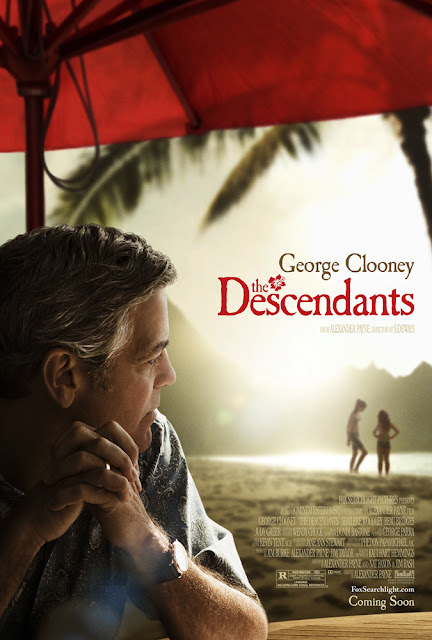 The movie earned 5 Oscar nominations including Best Picture, Best Actor for George Clooney (George did take home the Golden Globe), Best Editing, Best Director for Alexander Payne and Best Screenplay Adaptation for which it won the Oscar. Here's what I wrote about the film. Where Kaui Hart Hemming's novel The Descendants swept me away, I found the film as rich, complicated and emotional as its literary inspiration. A surprising and refreshing mix of funny co-mingling with the sad. A grownup's movie with an R rating owing to its use, primarily of the f-word. It's always difficult to watch a film and miss the parts that didn't make it to the screen; it's that depth and richness of setting and character development filmmakers don't have time for. So while I may have shed a quick tear for Matt King's home without the quirky housekeeper, the hospital without the scene in the gift shop where Matt the buys up all the soft core postcards flouting his gorgeous 15 year old daughter Alex, in a bikini, without the scene where Scottie hops on their beach club bar stool singing for a drink like her mother used to; I shed many more for what did make it into the movie. I've never seen George Clooney so unattractively attractive. He wears faded cotton Hawaiian shirts tucked into dockers. Tucked in. Not cool. Kind of like a nerdy accountant. He never gets to dazzle us with his movie star smile or twinkle sardonically. He never gets to be George Clooney. Instead, he is Matt King, a man whose wild wife is in a coma caused by a boating accident, who has two daughters he has no idea how to deal with, a huge decision about what to do with a land inheritance, and the newfound knowledge that his wife was having an affair. He's a man at once confused and angry and grieving by the events taking place. Every gesture, every stunned expression, every look of resignation rang true. When he cried, I cried too. As in the book, his daughters shock him with their behavior and their language. The eldest daughter, Alex played by Shailene Woodley was honest and pure in her disgusted responses to her father and deserved anger with her comatose mother. She's a natural beauty too with the most amazingly expressive eyes, an actress one wants to watch. Young Amara Miller is pitch perfect as the both moody and needy Scottie. Matt Lilliard, formerly known as Shaggy and that guy in Up A Creek with Seth Green and Dax Shepherd, made the most of his small amount of screen time as did Judy Greer. I also enjoyed Nick Krause's performance, the stocky young actor played Sid the stoner with a wide and open grin, providing much of the comic relief. In a nice nod to Hemmings, she "played" King's secretary. I think she had a line, maybe two. Still, it must be sweet satisfaction for her. 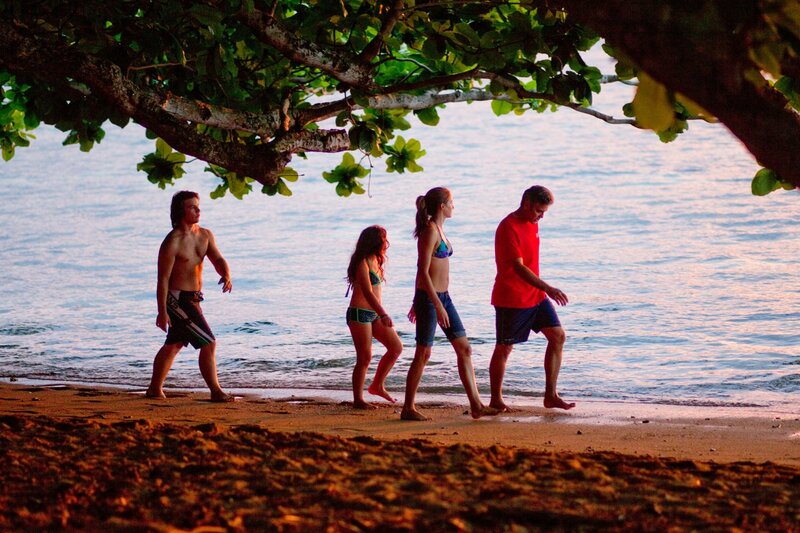 Alexander Payne, the director, who is known for his interest in locales and settings, showed Hawaii perfectly. The real Hawaii; not just the postcard picture perfect place we imagine when booking vacations. Oahu with it's crowded freeways, its big city with its share of poverty, and homelessness, and ugly architecture, its beautiful beaches crowded out by hotel after condo after hotel, as well as the soft and lovely landscape where guess what, sometimes it gets a bit grey. Sometimes it rains. Paradise isn't all it's cracked up to be. 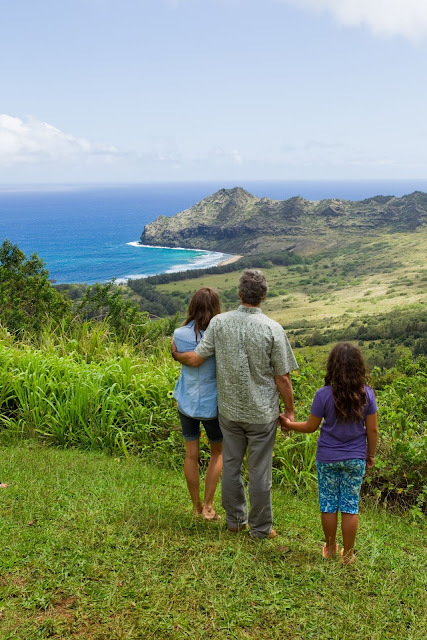 While there are spots of breathtaking beauty - notably the thousands of acres of land fronting an idyllic bay that Matt's family has owned for generations and which he now has to decide what to do with - I don't know that I've ever seen a film that painted Hawaii as a setting so realistically. Payne has said himself that the film is a little exposition heavy - the George Clooney voice over does come in quite a bit. But for me it was pitch perfect. Mature. Deep and velvety. At times bemused, at others the confusion, the anger, the hurt, but finally the contentment rings through. You should see this movie. I hope you've read the book but even if you don't, you should see this movie.